Pam Dignan has been tripping the light fantastic since she was a little girl and has run her acclaimed dance school, Pam Dignan Dancers, based in Westhill, Aberdeenshire, for almost 35 years. Pam teaches highland, national, tap, freestyle, ballroom/Latin, Scottish country dancing, ballet and preschool; but she has a passion for highland and has travelled all over the world with her highland dancers who perform at events, displays, festivals, highland games and championships. When did you start the Pam Dignan Dancers? When my son was one year old, I began the school with just 10 pupils. My son is 35 now! And, currently, I have around 200 pupils! What is it about dancing you like? I don't know. It just makes you feel good, doesn't it?! And I've been dancing since I was 10 years old, so I've always loved it. Is dancing in your blood? Well, my grandfather was a dancer. 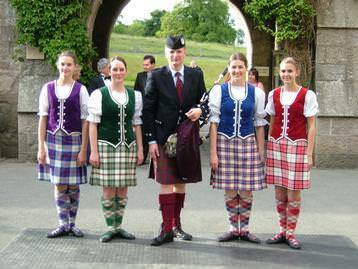 Actually, he was a dancer with the Gordon Highlanders and he would dance at the Highland Games. But that was a long time ago — it would have been during the war. 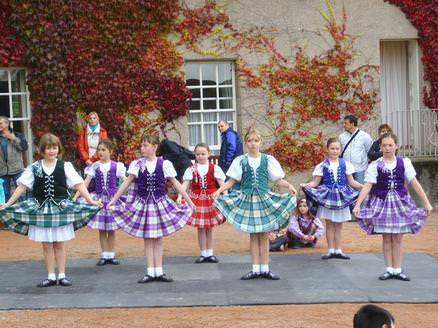 First of all at a dance school in Huntly, Aberdeenshire, between the ages of 10 and 17. Then around the age of 18 I was taught by Bobby Watson at the Watson School of Dancing in Aberdeen. If you're into highland dancing, you'll know Bobby's name. 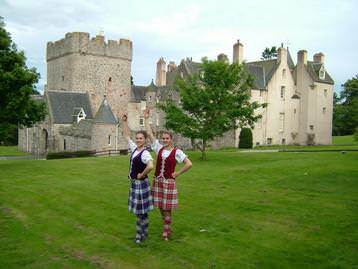 He was a World Champion highland dancer who was on TV and famous all over the world. What types of dancing do you teach at your school? 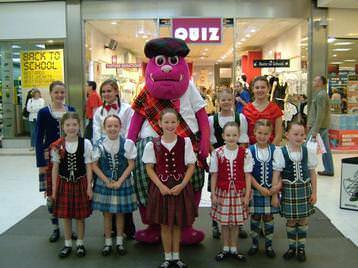 I teach a variety of styles but highland dancing is the main thing. I love highland dancing. It's very precise, very energetic and it's very good for you! It's like an aerobic workout because you're perspiring but you're also learning something — in this case something traditionally Scottish. There are set steps and dances, but I also choreograph traditional dances, such as sword dances, that we might be performing at exhibitions or events. I use different types of music, too, such as Amy Macdonald. Not just bagpipes! What ages are your pupils? All ages, from three up to 43... and older. I lose some pupils when they go away to university... but the great thing is that, later, they often come back to me. I do stream my classes and the best pupils come twice a week and perform at demonstrations and events. Which do you prefer: teaching or dancing? I love both, but I'm probably better at the teaching than the dancing these days! I love being able to show people who think they can't do something that, actually, they can. And I've got some pupils who are really, really good and who are going to the highland dancing World Championships at the Cowal Highland Gathering in Dunoon this August. That features dancers from many different countries. Is it hard to teach children? The children I teach are all really lovely. And when you teach a child to dance who couldn't dance before – it gives them such confidence, which is so wonderful to see. And if it's something difficult like the sword dance — you know, where you cross swords on the floor and dance around them, into them and over them — well... once they can do that, they think that's brilliant. The three year olds come to a preschool class where we use flags and baubles and fairy crowns, which they love. Every day, including four hours on a Saturday and two hours on Sunday. We're always open to new members and no-one has to audition. Plus I teach a Scottish country dancing summer school at The University of St Andrews and highland dancing to students who come from all over the world: Germany, America, Japan... everywhere! You've travelled all over the world with your dancers, too, haven't you? Yes. The very first time was when I took four dancers to the 19th Flower Festival in Debrecen, Hungary: that was probably back in the 1980s. Since then we've been to Belarus, Austria, Turkey, Russia, France — and I'm off to Verona this year to teach Highland Dancing to some Italians! And last year we went to Venice which was just beautiful. Are there enough boys in your school? I've one boy who's 11 and he's an excellent dancer... and in a class with 10 girls. And I've another wee boy who started recently who's four. Apparently he was watching the Tattoo during Hogmanay on television, and afterwards he said: "Mummy, I want to go to Pam&apos;s dancing!" There's always room for more! Look at world champion David Wilton. He is just a fabulous dancer. What do you think of Strictly Come Dancing? 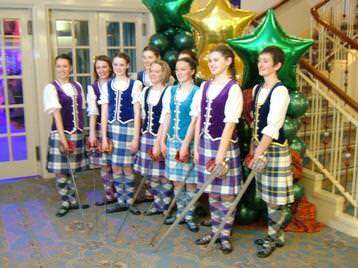 From the Stats Company- "A spectacular display at the Beach Ballroom"
From Children 1st Charity Tartan Ball - "A superb display from these outstanding dancers, a delight to watch"